Mike Graham, Colin Moreland, Brian Raine, Greg Ross and Ian Stevenson. 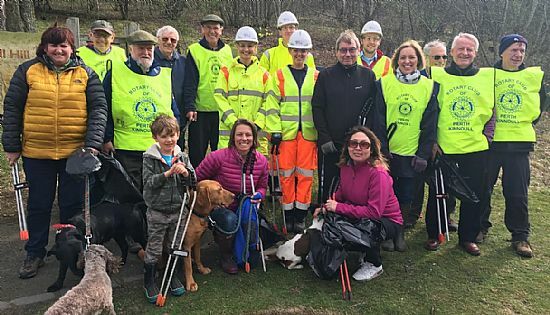 This year was the most successful there's been and with 35 volunteers in total turning up including contingents from Bear Scotland, Perth Kinnoull Rotary Members and Santander. There was an afternoon session with 21 pickers managing to fill 20 full bags of rubbish and 14 pickers for the evening session managing to fill 14 full bags. All the usual plastic bottles, drink cans, discarded tissues and the usual main culprit discarded dog waste bags. Bag it and BIN it folks. Find of the day has to be a 45 year old crisp bag. What a surprise to find a crisp packet from 1974 - at 2p a bag, who remembers Smith's Savoury Vinegar Crisp? 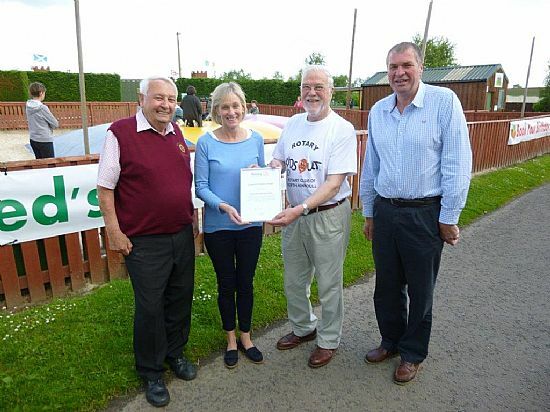 Kinnoull Hill Woodland Hill Park User Group Chairman and Committee want to express their thanks to the outside help from Bear Scotland, Perth Kinnoull Rotary Members and Santander. The Woodland Park is made up of five hills. Barnhill Dundee Road side, Corsiehill, Kinnoull Hill being the main one where the tower is, Deuchney Hill where the Jubilee car park is and Binn Hill where the Binn Tower is. 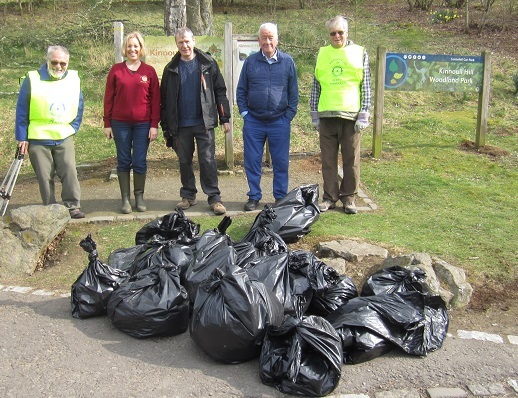 Thanks to outside help we managed for the first on the same day to litter pick all 5 hills. Several Perth Kinnoull Rotarians attended Fairview School to view the new facilities provided by a donation from the Club. 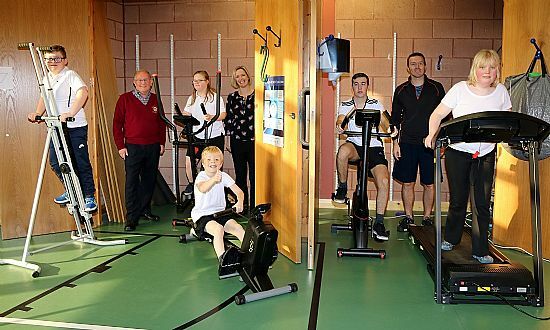 Pictured are the children with Colin Moreland, headmistress Leigh Verdot and PE teacher Stuart Farmer. Kids Out Day is held each year in early June. The purpose is simple - to give disadvantaged children a great day out! This year we have two schools participating. Fairview Special School, Perth, and the Autistic Base in Robert Douglas Memorial School, Scone. Our local event takes place at Active Kids in Stanley. Over 40 children, accompanied by their carers and parents, take part. The management at Active Kids waive all entrance fees, a wonderful gesture in the true spirit of caring for others. Each year Rotary in Great Britain and Ireland run Kids Out Days for around 25,000 disadvantaged children. 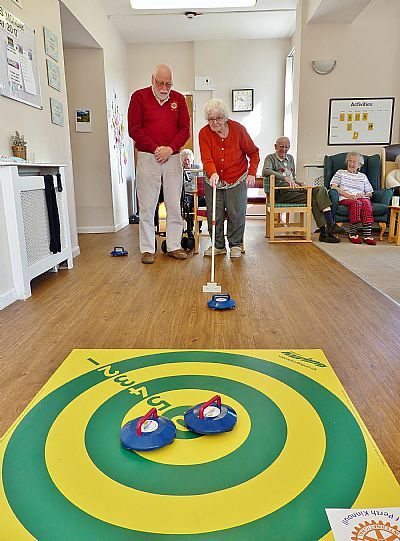 The Community Service team have started this month going into residential homes to encourage the residents to play indoor Kurling (with a 'K') and Putting. This has only been possible thanks to the 12 fantastic volunteers who have volunteered an hour or so once or twice a month to visit Viewlands House, Kincarrathie House, Robert Doouglas Memorial Home and Catmoor House. To enable this activity the Club has generously purchased 3 sets of Kurling equipment and a Putting set at a total cost of £846.25. Residents seem to enjoy the experience, as do the volunteers who may also be assessing the quality of play for a future event. 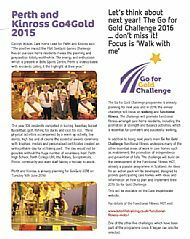 Go4Gold was a new venture for our Club although last year 3 members did volunteer to act as helpers at the event. The Go4Gold Games took place for the 3rd year at the Bells Sport Centre on the 17th June. 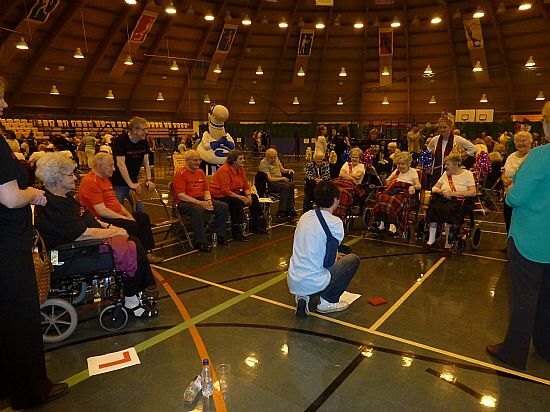 The participants of the games are all residents in care homes from around the Perth and Kinross area. This year there were 40 teams each with 3 members who had made uniforms and banners ready to play. The day started with all the teams marching round the hall with banners high. The work that had gone into the uniforms and banners was remarkable some of the banners were humorous and some very intricate. The games played included Kurling, putting, catching ducks, filling cups of rice, beanbag to bucket etc. After the games the players had lunch while girls from Perth High School played background violin music. After lunch the awards were handed out, and then every team received a certificate of performance. The old people really seemed to enjoy themselves as did the organising team and the Volunteers. Our club volunteers considered it a great experience. 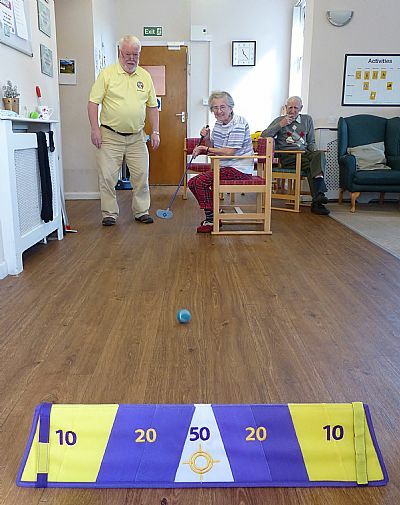 Prior to the games a team of 3 members went into 5 residential homes in Perth and coached the teams in Kurling and putting.